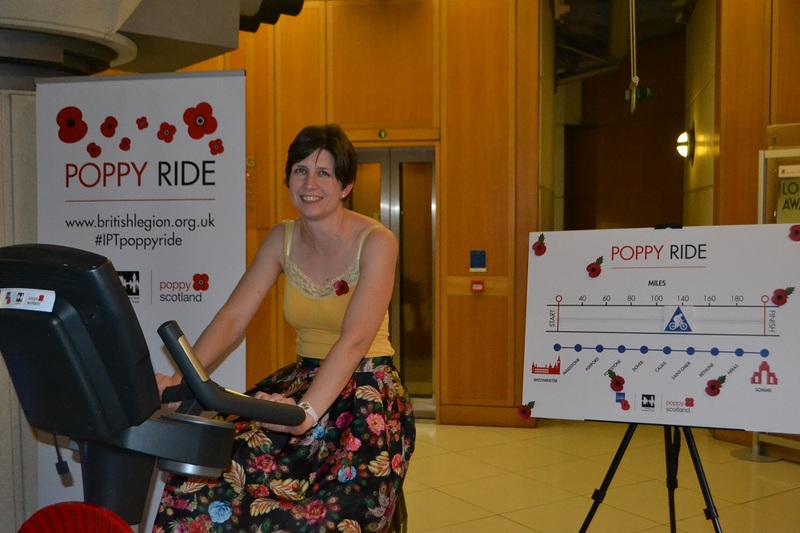 Yesterday (Wednesday 2 November) Glasgow Central MP Alison Thewliss, the Director General of The Royal British Legion and over 80 other Members of Parliament raced against the clock on an exercise bike to raise money for The Royal British Legion’s annual Poppy Appeal. The 12 hour bike ride was held from 08:00 to 20:00 in Portcullis House, Parliament and aimed to raise money for the Legion’s National Poppy Appeal. Alison Thewliss represented her local constituency by cycling as far as she could in 5 minutes, with the hope of topping the leaderboard and beating last year’s winner David Davies, MP for Monmouth in South Wales, who cycled an impressive 2.46 miles in 5 minutes. Alison Thewliss managed to cycle 1.8 miles in 5 minutes. The bike ride was organised by the Industry and Parliament Trust (IPT) in association with The Royal British Legion and follows on from the successful bike ride held in 2015 (where 77 MPs and Peers cycled a total of 128.8 miles in 12 hours). Members of the Welsh Assembly also undertook the same challenge as the two legislatures aimed to collectively cycle the distance from Westminster to the Somme in France to mark this year’s centenary of the Battle of the Somme. “I would like to thank the Industry and Parliament Trust and The Royal British Legion for arranging this event. The Royal British Legion and Poppyscotland provide invaluable support to the Armed Forces community; I am pleased to have been able to support such a worthy cause.